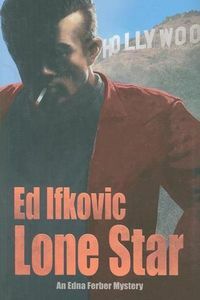 Lone Star by Edward Ifkovic, a Mysterious Review. Edna Ferber's award winning novel, Giant, is being adapted and produced for the silver screen by Jack Warner. He has invited Edna to Los Angeles to be on the set while filming the final scenes. An old friend, Mercedes McCambridge, has a principal role in the film making it special reason for her to accept the invitation. There she meets the stars of the film: Rock Hudson, Liz Taylor, and Hollywood's latest teen idol, James Dean. Trouble is looming on the set, however. A bit player in the movie, Carisa Krausse, has been fired and is now threatening to publicly accuse James Dean of fathering her unborn child. This is fodder for not only the tabloids, but is also national news, thereby risking the much publicized release of the movie. Warner insists the company will take care of shutting the rumors down. Even though Dean denies the claim he goes to see her inciting a violent argument heard by other tenants in the building. When she is later found dead in her apartment, James Dean becomes the prime suspect. Most people who knew James believed he was very capable of killing. After all, he was mean and had a bad temper when provoked. He would hit a woman if she rebuked him. But Edna does not see this side of Jimmy and she does not believe he is capable of murder. With Mercedes at her side, Edna decides to do a little investigating on her own. She goes to Carisa's apartment on the seediest side of Los Angeles where she encounters half-truths, bold lies, distrust and resentment. But she is determined to find the truth. Will she? And if so, will the truth be what she hopes it to be? Special thanks to guest reviewer Betty of The Betz Review for contributing her review of Lone Star. Acknowledgment: Poisoned Pen Press provided an ARC of Lone Star for this review.